CARDS and letters have flooded into the New Journal offices sending messages of love and support to our columnist Rose Hacker. 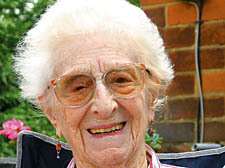 Rose, aged 101, whose insightful fortnightly think-piece was praised in this year’s Press Gazette awards and who is the oldest newspaper columnist in the world, has been in hospital for the past 10 days. The get well cards we have received have included tributes to her lively journalism. Another fan, Wilma Morrison, told Rose how she cuts out the column and passes it on. Angela Sinclair, of the Islington Pensioners Forum, said: “We wish you a speedy recovery, and our warm thanks for your excellent and inspiring articles.